Internal rate of return is method used for investment appraisal that calculates the rate of return that is expected to be achieved by the project. 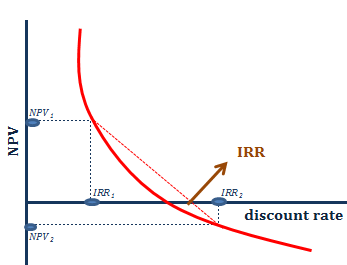 IRR is related with NPV method as it is the discount rate at which NPV is zero. Rough estimate of IRR and calculation of NPV with this rate as discount rate. Advantages and disadvantages of IRR compared to NPV can be easily derived from article about advantages and disadvantages of NPV.